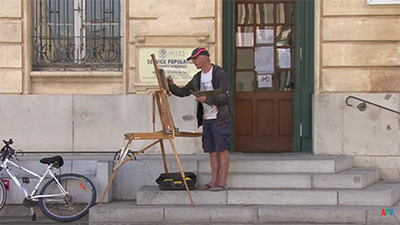 Herman is a painter of light who works outdoors whenever possible. 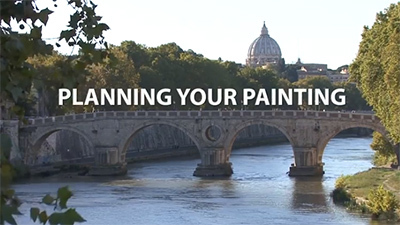 He encourages us to identify a focal point, to exaggerate the light effect and the shadows and, if necessary, borrow elements from the surrounding area to improve the composition. 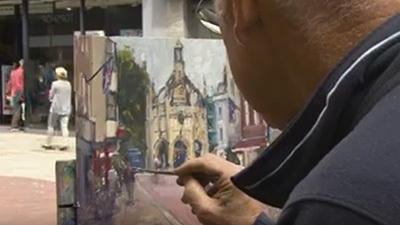 In this film he selects street views in his home town of Melbourne before journeying to the UK and finding some wonderful subjects in the countryside in and around Faversham in Kent. Take a tour - pick up the new DVD from Herman Pekel this month and travel the globe from the comfort of your armchair. 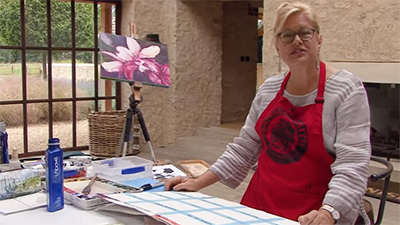 A Journey in Watercolour sees the popular Aussie artist tackle street scenes in Melbourne and rural landscapes in Kent. Out and about with watercolour - working in situ, firstly around his home town of Melbourne, before travelling to England to Faversham in Kent,Herman Pekel's new film for APV - A Journey in Watercolour - takes light as the primary theme. 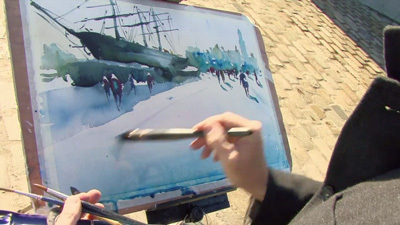 Encouraging us to identify the focal point, Herman shows us how to exaggerate the light effect, making the light lighter and the shadows darker, to create watercolours that are full of life. He demonstrates that tone is as important, if not more so, than colour. Working fast, and often breaking the rules and abusing his materials, he shows us how we need to make every wash count. 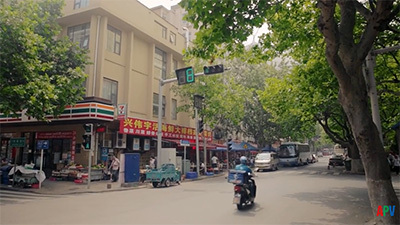 There's a sense of magic to this film, as Herman Pekel creates coherent compositions from the most unpromising of subjects. The first two demonstrations are street scenes in his native Melbourne, where he marshals complex and often confusing elements into lively paintings that retain a sense of life and movement. A move to Faversham in Kent finds the weather overcast and the light flat. 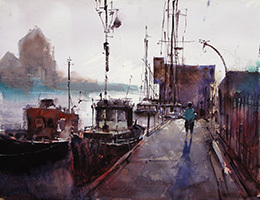 A muddy river at low tide seems to provide few opportunities, and yet Herman pulls the elements of three compositions together, moving boats and even landscape features and using cool colours to reflect and yet not directly depict the conditions he finds. There are nuggets of wisdom throughout � �Never let a sky dry until it�s finished�, �A dirty palette always has lovely greys�, If there�s a problem it�s that spontaneity means little planning, and a direct narrative doesn�t always emerge. The results make up for it though. Herman Pekel is a magician. Most of the commentary on this film is something akin to a running patter with occasional nuggets of wisdom (�Never let a sky dry until it�s finished�) dropped in apparently at random. In fact, it took me half the film before I had any idea how I was going to find anything to say about it. Part of the problem is that he likes unpromising subjects, but they are in fact the proverbial blank canvas, ideas on which a composition can be superimposed and a painting built. 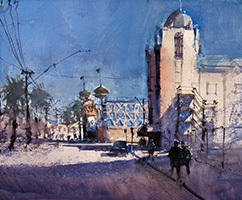 The first two demonstrations take place in Herman�s native Melbourne and are complex street scenes that need careful marshalling of shapes, colours and structures. Spontaneity is Herman�s stock in trade and he allows the work to develop almost with a life of its own. The result is that, because he has no detailed plan, the audience is similarly in the dark and this can make viewing difficult. Where the film comes into its own, however, is when we move to Faversham in Kent. A dull day, a flat landscape and a muddy river at low tide do not augur well. 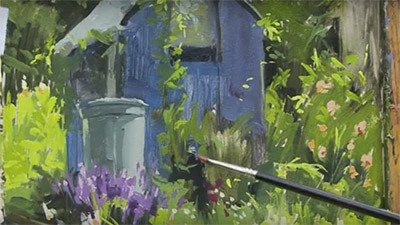 However, this is where the magic happens, because Herman pulls three amazing pictures from, quite literally, nothing, manipulating elements of composition, adding boats, vegetation and a church and working in cool colours that reflect the conditions without actually portraying them. One of the things you also notice is that Herman is a fan of darks � �A dirty palette always has lovely greys�. It�s in conditions like this that spontaneity comes to the fore and Herman really does create something out of nothing. A rabbit out of a hat, in fact. Absolutely brilliant dvd! 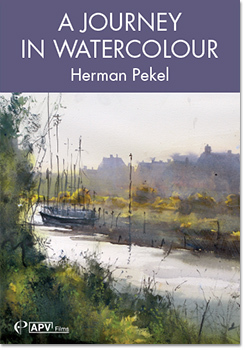 Herman paints mesmerising watercolours, and is instructional without being 'precious' in any way. An easygoing charming manner, and fabulous results, definitely recommend this dvd.